Meerkat and Periscope may have been leveraging the livestreaming phenomenon up until now, but Facebook has finally arrived on the streaming scene. Wednesday, the social media leader launched a new “Live” feature in its Mentions app that will let celebrities with verified Pages start a Live broadcast on Facebook. These broadcasts will appear in the News Feed and include overlays of real-time comments from viewers. Only celebrities are able to broadcast through the new feature, with The Rock and Serena Williams streaming today to celebrate the launch of “Live.” TechCrunch.com posted more on Facebook’s first foray into livestreaming. 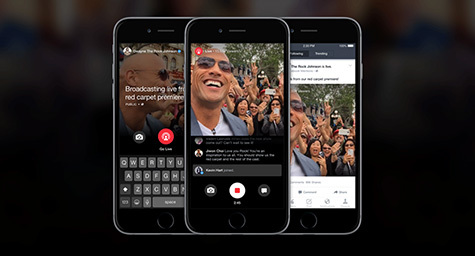 To ensure that a celebrity’s fans and followers can view their videos while in progress, Facebook will immediately post a celebrity’s livestreaming video directly into the News Feeds of users who subscribe to their Page. In addition, Facebook will send push alerts about a celebrity’s broadcast to users who have recently interacted with that the celebrity’s Page. Viewers can engage with celebrities while they’re watching these videos by leaving comments that the celebrity will see. Facebook doesn’t want to distract or confuse celebrities while streaming, so they’ll show these comments at a readable rate and offer the option to turn them off. Of course, inappropriate comments will be deleted and broadcasters can specify subjects they don’t want to discuss on their Page’s moderation blacklist. With Facebook’s “Live,” videos won’t disappear after they’re livestreamed, as they do immediately on Meerkat and after 24 hours on Periscope. Instead, the Live feed story will become available as a regular video. Of course, they can be deleted by broadcasters who want them to seem more mysterious, but since 53% of Facebook video views come from re-shares, it’s smarter to keep them easily and eternally accessible. Facebook believes that celebrities will opt to stream on the social media leader because neither Meerkat nor Periscope can deliver such extensive reach. Also, most celebrities post on Facebook every day, so the site is a more convenient place to livestream because they’re already on it, just like their fans. Learn the latest social media marketing strategies. Contact MDG Advertising today at 561-338-7797 or visit mdgadvertising.com.